As of April 10, thousands of people had signed up on Facebook pages that they planned to protest a $1,000-a-person fundraising event for presidential candidate Donald Trump in midtown Manhattan on Thursday, April 14. 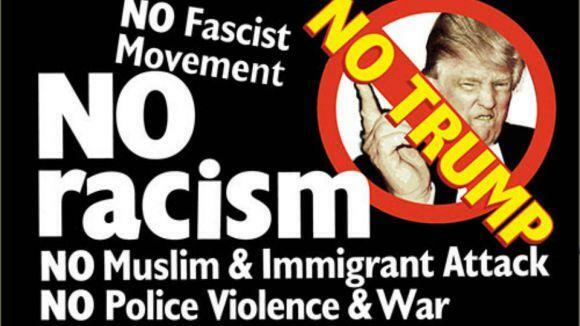 In a news release calling an April 11 press conference, organizers wrote: “Inspired by the peoples’ shutdowns of Trump speaking engagements in Chicago and Cincinnati, New Yorkers with the Black Lives Matter movement, migrant rights groups and others intend to shut down Trump’s incitement of racist violence in New York. Grand Central Terminal. The protest is set for 5:30 p.m.
“We’re on the side of the people. Trump is on the side of racist terror,” said Moore. Coalition members include the People’s Power Assembly; NYC Shut It Down; ICE-FREE NYC; Millions March; the Pakistan-USA Freedom Forum; International Action Center; Million Student March; the Revolutionary Student Coordinating Committee; Queer Detainee Empowerment Project; Stand Up for Racial Justice; Workers World Party; South-Asian Fund for Education, Scholarship & Training; May 1 Coalition; and We Will Not Be Silent. For more information, see Shut Down Trump in NYC on FaceBook.